Classic chrome slice in an exciting range of new colours that emit a fantastic flash effect in the water. Proven on many predatory & pelagic species. The original Australian designed and developed lure that has been a favourite amongst Aussie anglers for many years. A versatile lure in a large range of colours and sizes that can be used for spinning, jigging or trolling for many fish species. A soft plastic octopus bait with soft, pulsating tentacles. Ideal for trolling for pelagics, game fishing or any species that prey on Cephalapods. A soft squid bait with pulsating tentacles and vigorous action. 12cm model is ideal for trolling for pelagics, game fishing or any species that prey on squid. 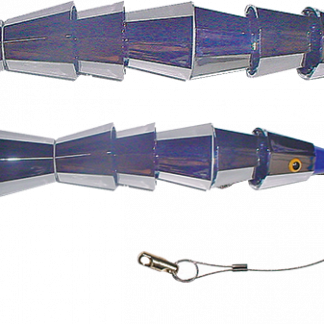 6cm model is great for surf fishing or as an inshore/ estuary lure for Tailor, Salmon and more. Use in place of baited hook as a very effective attractor in the surf when chasing Australian Salmon and Tailor. 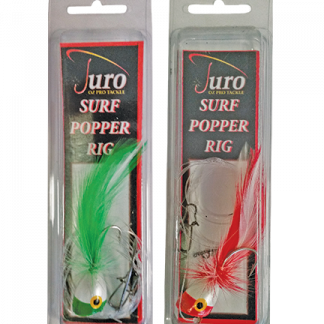 Juro Surf Popper Rigs are conveniently rigged ready for the angler. Simply tie the end of line to the Rolling Swivel and attach the sinker onto the clip. A truly awesome teaser with amazing flash and light reflections. The specially designed weighted head with eyes and nose enables the Voodoo Doll to get down under the surface where most teasers just will not go. Designed, developed and made in Australia.